For beginners & advanced players. Learn the correct styles of 5 leading Dobro players. Dan is accompanied by a full Bluegrass band, with dobro recorded in the left channel & band in the right. Dobro solos are played again slowly at the end. Volume 1: Josh Graves Carroll Country Blues, Foggy Mountain Chimes, Brother Oswald Dobro Chimes, Farewell Blues. Mike Auldridge Mountain Slide, Southern Rain. Jerry Douglas Train 45, Irish Spring. Tut Taylor Southern Filibuster, Oasis. Volume 2: Josh Graves: Great Speckled Bird, Shilo March. Brother Oswald: I'll Be All Smiles Tonight, Sailing Along. Mike Auldridge: Cannonball, Dobro Island (contains a twin part). Jerry Douglas: Bill Cheatham, Redbud Rag. Dan Huckabee: Remember Me, Somewhere Over the Rainbow. -------------------------------------------------------------------------------- About Dan Huckabee Dan Huckabee, has a degree in Music from The University of North Texas. He won the National Dobro Championship, & has played with The Allman Brothers, Lyle Lovette, Nancy Griffith, & Robert Earl Keen Jr, just to name a few. 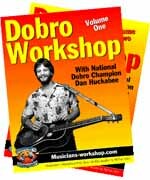 Dan founded Musician's Worskhop in 1973, teaches Guitar, Dobro, Mandolin, & Harmony Singing at The University of Texas Informal Classes, has taught workshops & seminars at festivals all over the United States, & has authored over 250 music instructional products. So get comfortable & let Dan's lifetime of musical experience guide you through everything you need to know in the quickest & easiest way possible!